One of the best things you can do in regards to securing your hosting account is to regularly change the password for your account. When you receive your hosting account welcome letter, it is always a good idea to go ahead and log into your account and change the password. This way, should someone come across your welcome letter, the login information listed in the welcome letter would not be valid. However, changing your password also raises some responsibilities. You need to be sure that you change your password to a good password and not something that is easy to guess. If an account is hacked into due to a poor password choice, then ultimately the account owner would be as much to blame for picking a poor password. This article will explain how to change the password for your account and how to choose a good password. This information should be in your welcome letter when you sign up for a hosting package. Complete this form as instructed to change your password. 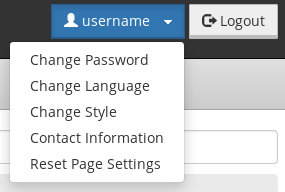 You now need to use this new password to log back into your control and for subsequent logins. It is a good idea to change your password regularly, in case a hacker does gain access to your password. If you change your password regularly, then a hacker would have to know your current password to gain access to your account. If you forget your account's password, we can reset it for you. We cannot retrieve your current password, we can only set a new password for your account. To have us reset your password simple complete the Password Reset form. We will require payment verification information so we can verify account ownership. If you do not have that information, then we can't reset the password for you. The individual that pays for the account should have this information available to them.